When you become the director of a limited company, there are rules and regulations you must follow, as detailed in the guide below. As the director of a limited company you have legal obligations which you must take into account when you start your business. The issues surrounding company tax legislation are probably the most important, and you need to understand them. 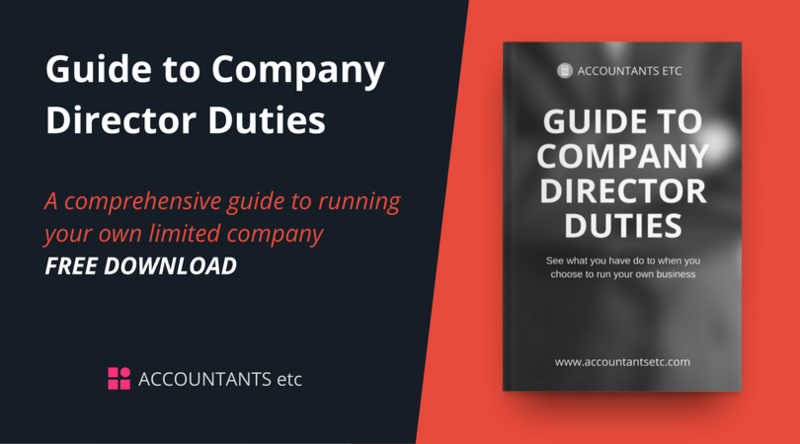 This guide will focus on the obligations directors have to Companies House and HMRC. It details the information you need to understand what is expected of you when it comes to the legal responsibilities and tax legislation of these two authorities. Most people have heard of HMRC, but Companies House is responsible for incorporating and dissolving limited companies. It also manages the information it collects from all UK-registered businesses, and makes it publicly available. HMRC is the UK’s tax and customs authority and administrates and collects your personal tax. They also collect company VAT, PAYE, National Insurance contributions, corporation tax and other relevant taxes. A limited company is a legal entity that can be established quickly and easily. There are few restrictions on who can set up a limited company, and who can become a director. Naturally, this comes with degrees of responsibility, with the directors taking ownership for the company’s affairs. Financially, it is separate from your own finances and once the appropriate tax has been paid on it, all of the profits made are owned by the company and available to be shared among the shareholders. Having limited status means that you are better protected should anything go wrong. Providing no fraud has taken place and you have not given personal guarantees, you will not be personally liable for the company’s financial loss. As a director of a limited company you can decide your own salary and also decide when to take dividends so that you can be more tax efficient. Every limited company has shareholders, but it is the director who is responsible for running the company and he or she doesn’t necessarily have to own shares. You can become a company director if you are 16 or over, unless you are an undischarged bankrupt, or have been disqualified from being a director. From the Companies Act 2006, it goes without saying that as a director you must legally try to make the business a success, while making decisions which will benefit the company rather than you personally. All contracts must be made with the company rather than the individual and you must follow the rules shown in the articles of association, which are the rules you all agree to about how the company will run. You must keep records and report changes. You must register for self assessments and send annual personal self assessment tax return. You can hire someone to manage these but you will still be legally responsible. You must also tell other shareholders if you may benefit from a transaction personally. Companies House incorporates and dissolves limited companies. It administers all aspects of the company register and manages the information, making certain information available to the public. When you decide to start a limited company you must register it with Companies House. Your obligations will include submitting your annual return, accounts and telling them about any changes to your company. As a director of a limited company you must submit a compliance statement, which can either be posted or completed online. Companies House charges £40 for paper submission or £13 for online. The compliance statement is a legal requirement and once you have filled it, it gives Companies House confirmation of the information they need about your limited company. This includes details of the directors, the company’s registered office address, service (correspondence) address, and details about the shareholders. If you have a company secretary, you will also have to provide this information as part of the compliance statement. The date on which your annual return is due is usually the annual anniversary of the company’s creation or the last annual return. You then have 14 days after that during which you can send the form without being penalised. Ensure you always note the date in your diary for future reference or register with Companies House for reminders. If you do not submit your compliance statement, your company may be struck off the Register of Companies - and it could be costly to resolve this. As a limited company director, you need to submit an annual return, and you have to submit annual accounts to Companies House, which are made available for public inspection. These accounts must be an accurate and fair insight into the finances and should ‘report on the performance and activities of the company during its financial year’. It is vital that all companies keep records of their accounts regardless of whether or not they are actually trading. The annual accounts record must include information about the sales, running costs and profit or loss, as well as providing a record of the assets and the liabilities of the company. Unless you are filing accounts for the first time, the time allowed for submission is nine months from the Accounting Reference Date (ARD), which tends to be at the end of the company’s financial year and the anniversary of it for a private company, or six months from the ARD for a public company. For a new company, the first ARD is the last day in the month in which the company’s first anniversary falls, with all subsequent ARDs falling on the same date for each subsequent year. It is possible to change the ARD, but there are restrictions in doing so. The directors of the company are obliged to prepare accounts for each financial year. Within these it is important that you include both the profit and loss. There must also be a balance sheet that is signed by the director, as well as notes to the accounts. Larger companies may require an audit report, and groups of companies may require consolidated accounts. You should also include a directors’ report with a business review if the company doesn’t qualify as small. Small companies are permitted to submit abbreviated accounts to Companies House which restricts the information available to the public. However, full accounts must still be provided to each shareholder. There is no charge for filing accounts, but failing to submit them on time is a criminal offence. The penalties imposed depend on the length of delay in submission - for a private company they range from £150 for the first late filing offence and less than a month long to £1,500 for more than six months. Public companies will face fines ranging from £750 to £7,500 respectively. The fines are doubled if accounts are not filed on time two years in a row. Companies House can even have the company struck off the company register, and prosecute you as a director for not filing accounts. It is imperative that directors are aware of the legal implications when it comes to submitting their accounts. Accountantsetc can help by ensuring all the required documents and details are completed properly and submitted on time. HMRC collects personal tax and corporation tax as well as VAT, PAYE and National Insurance contributions, customs duty and all other taxes. Once you have set up a Limited company you must tell HMRC the date the company started, its name and registered number as well as the business address. You must also tell HMRC when you start trading, the kind of business you run, the day you will be making your annual accounts up to and whether or not you are part of a group or have taken over a business that already existed. As a new business, HMRC will send you a CT41G form which includes your Company’s Unique Taxpayer Reference. You will receive this within a few weeks of the business being registered. The CT41G will provide details on how to give your information to HMRC, as well as instructions for setting up the company’s online HMRC account so that Company Tax Returns and Corporation Tax can be settled. You must tell HMRC that the company has started business activity within three months. Annual Corporation Tax which must be paid on any taxable profits the company makes including ‘trading profits’, investments and chargeable gains. As a director, it is up to you to ensure that corporation tax is paid. You won't receive a bill; instead you must complete a Company Self-Assessment Tax Return and calculate the amount due. When you have calculated your tax due and settled your corporation tax bill with HMRC, you must file a Company Tax Return form known as a CT600. Even if you made no profit during the financial year your return must be filed and the return can cover a maximum period of 12 months. Abbreviated accounts can be filed with Companies House, but full accounts must be sent to HMRC in IBRXL format. The deadlines for each Company Tax Return differs depending on your financial year. Any tax due must be paid within nine months and one day after the end of the accounting period. The CT600 must be submitted within 12 months of the end of the accounting period. You must keep business records for at least six years from the end of an accounting period. £100 for being one day late. Another £100 for three months. After six months HMRC will estimate the tax bill of the company and add an additional 10% to the unpaid tax, with a further 10% being added to this after 12 months. If your returns are late three times in a row, the £100 penalties will be increased to £500 each. Clearly, it is in your interests to pay on time. Directors should complete a personal self- assessment income tax return each year unless the company is non-profit making, or the director does not receive payments or benefits from it. To comply with the Real-Time Information (RTI) legislation you must report payroll information to HMRC on or before anybody is paid, or monthly if no payments are made. It is the responsibility of the director to ensure that employees are paid at least the minimum wage and calculate PAYE and National Insurance deductions being taken and forwarded on to HMRC. Directors are obliged to submit VAT returns (if you are VAT registered) every three months to HMRC, regardless of whether or not you have any to pay or reclaim. It must include the total sales and purchase, the amount of VAT owed as well as the amount which you can reclaim, and what your VAT refund from HMRC is. You must ensure that the company registers for VAT on or before your turnover exceeds £83,000 per annum. 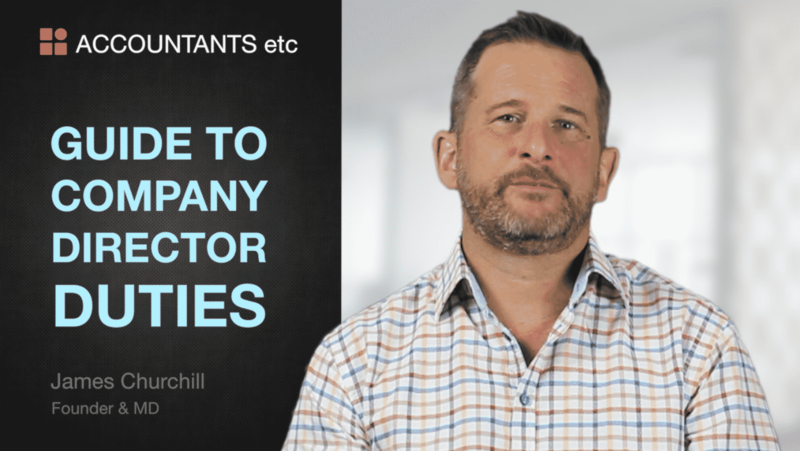 This may all seem confusing, but the most important thing to remember is that as a limited company director, you are accountable for your company’s tax and legal profile. If you don't comply or don't understand your obligations, you put yourself at risk of fines and even prosecution in extreme cases. It is essential that you receive the best type of advice to help guide you when you start your business. So don't take short cuts - invest in an accounting service. We are here to help you deal with most of the obligations covered in this guide, while also providing advice on tax efficiencies and your business finances. This will give you more time to focus on running your business. Remember though, you are still legally responsible for your obligations to Companies House or HMRC. Mistakes can be made when you have no professional experience in dealing with this side of a business and even the smallest slip-up can have serious implications for you as a director.